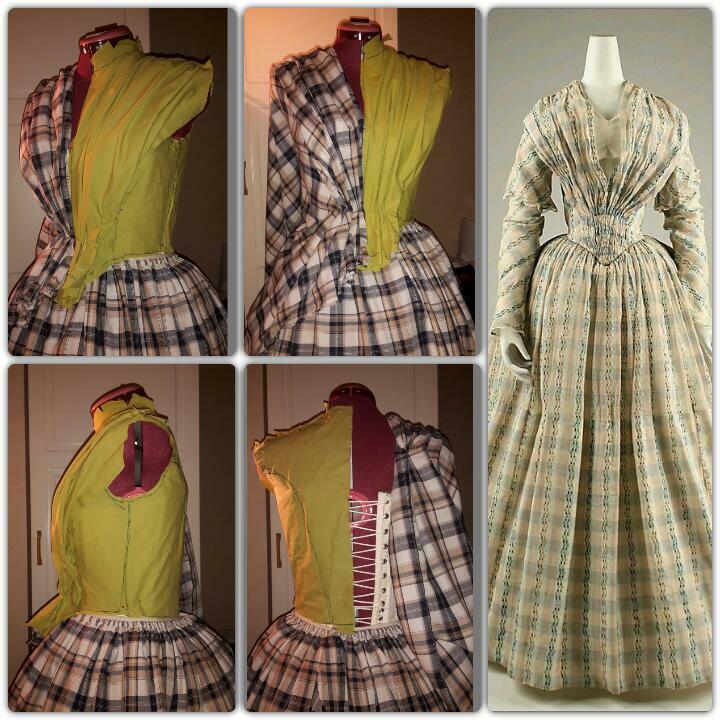 After finishing the skirt (and the Lady Mary dress) I continued on to the bodice on my 1850s summer dress. 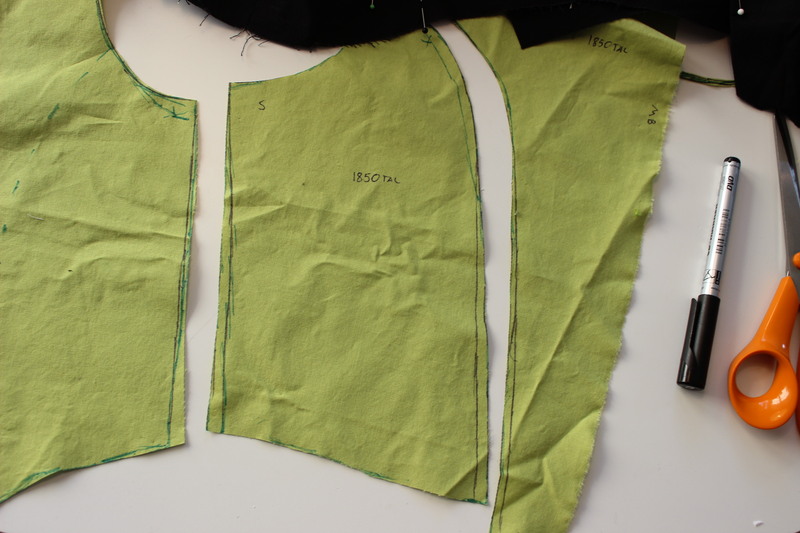 Using some green cotton from my stash I draped a pattern on my dress-form trying to get as close to the original shape as possible. Then I cut it out, stitched it together and tried it on. 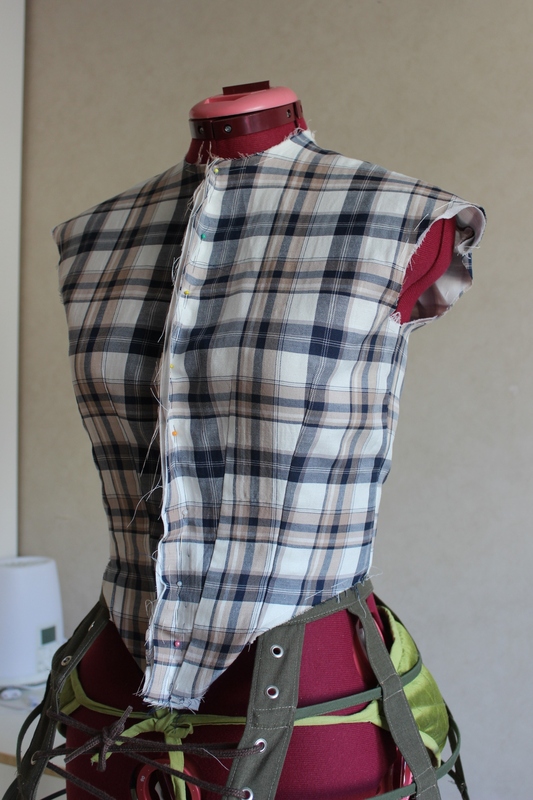 bodice with pinned darts on one side. I pinned the darts while wearing the mock-up. Then I took it of, marked and stitched them shut. And put it on again for one more try to see if i got it right. Looks pretty good I think. 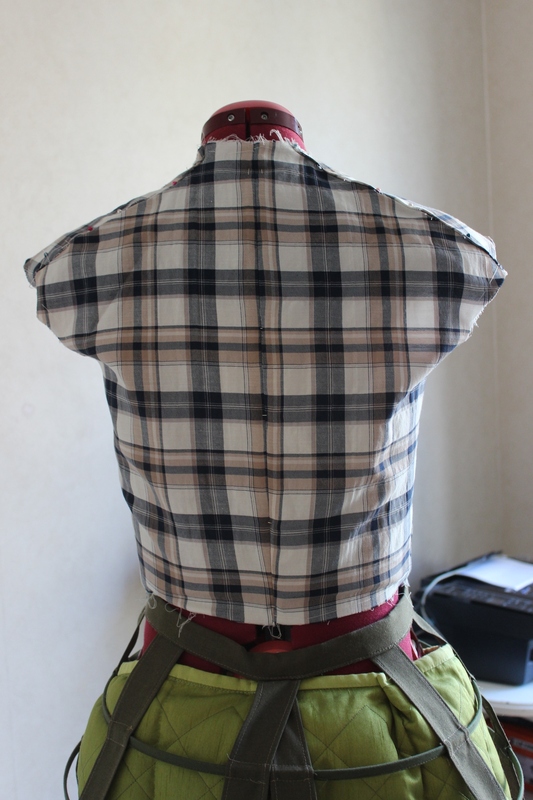 Then I altered the pattern, taking out a few millimeters at every seam to make it a tad smaller, and shortened the back bodice about a cm to make it end at the waist. And on to cutting out the pattern. 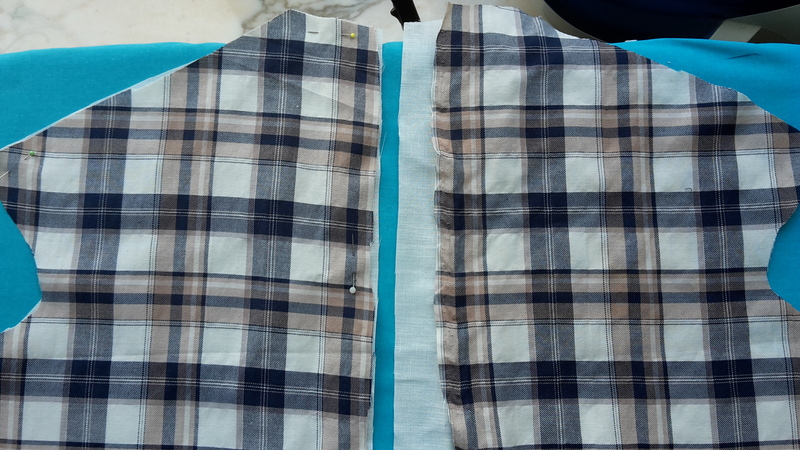 The pattern matching took a while, but whit lots of patients and pinning, I did get it right in the end. 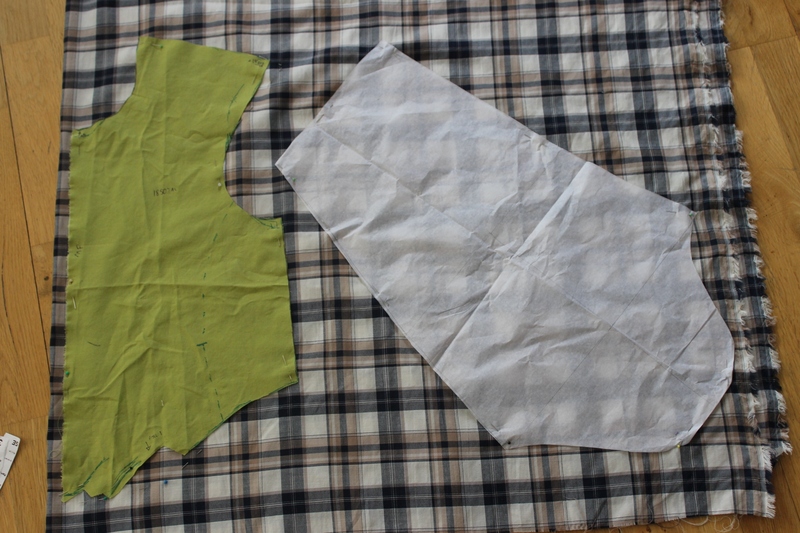 Then I basted the bodice pieces to the interlining (who also served as lining). center back being basted. I stitched the center back seam,but was not happy with the bad matching of the pattern. 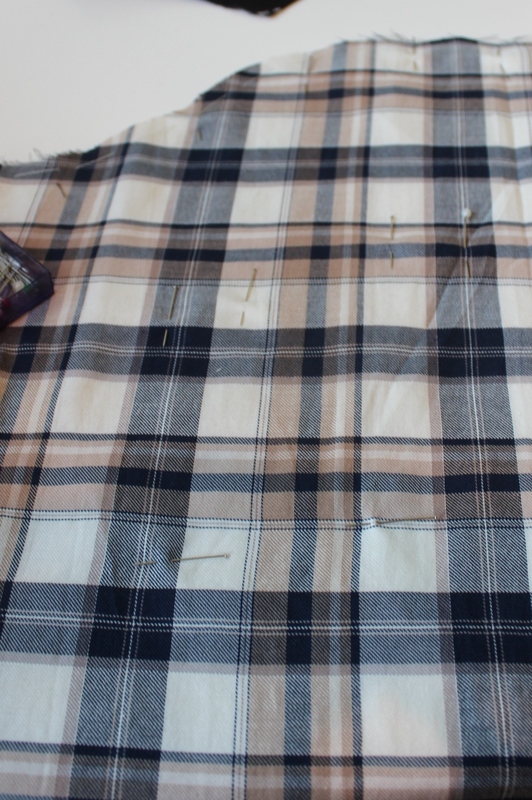 So I ripped out the seam and used three times as many pins as usual to really get the fabric to lay still while sewing (I could just have basted, but was to lazy at that point). 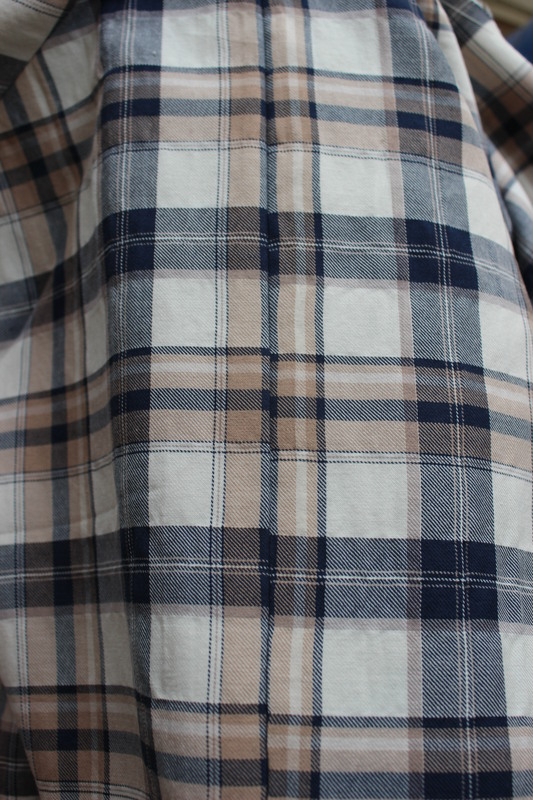 The result was much better, still not perfect, but I figured it wouldn’t show that much once worn. 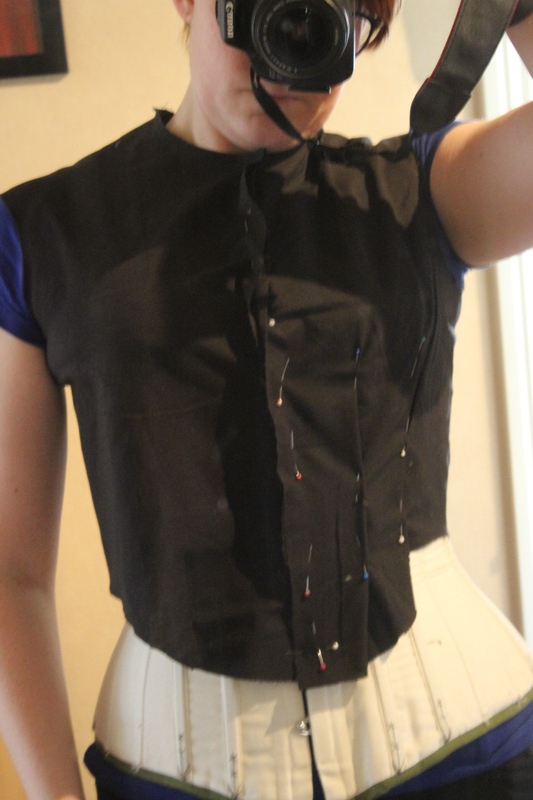 Then I marked, pinned and stitched the darts on the bodice front piece copying the markings from the mock-up. Then it was once more time to lace o the corset to check the fit. Looks good. the only thing I needed to change was to shorten the back length some more. The vertical crease at the shoulder blades is a consequence of my corset, and will disappear as soon as I get the back boning in. 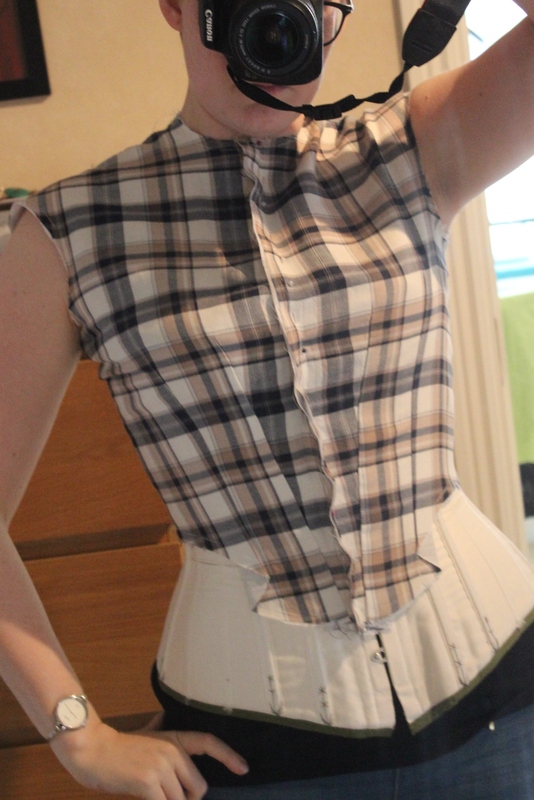 I really love the look of the bodice at this stage. 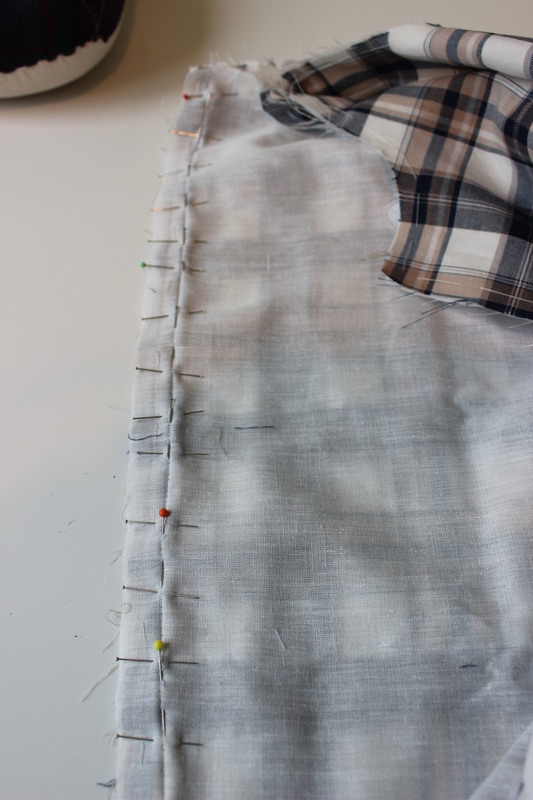 Now it’s time for the front draping. 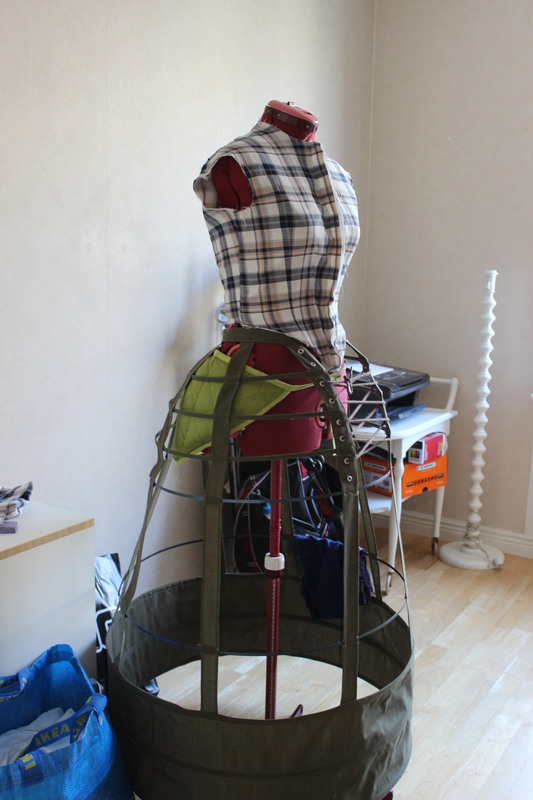 I used the pattern piece from my pattern draping, now cut in the plaid cotton, and pinned it to the dressform. My only problem now was to decide if I really wanted the draping or not. I loved the clean look of the un-draped bodice (and it would be so much easier and faster to finish), but my I think it was the draping who made me love the inspiration dress so much. The reason for the draping is the optical illusion of the teensiest waist ever. Look at the original photo — it looks like the woman was shaped like the letter ‘Y’ on top. And this was the standard look of the 1850s. 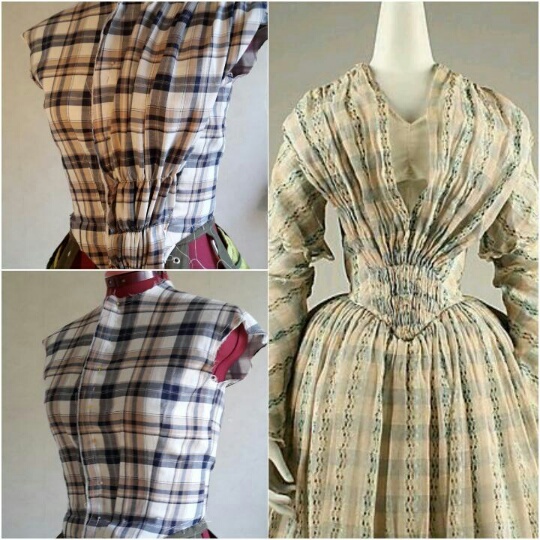 The bodices look so long and skinny to my 1860s-accustomed eyes! So I think that if you really want the look, I’d go for it. Especially as it is rare to see that kind of draping + hoop skirts any other time. Yeah, I know, and I think it looks beautiful. My problem was basically I was running out of time and didi think the bodice looked nice even without it. But I’m glad I took the time to make the gathered front now thet it is done.